Editor's note: Are you there? Share your story with CNN iReport, and view some of the photos of the situation in Tunisia we've received so far. Tunis, Tunisia (CNN) -- Tunisian opposition leaders joined the current ruling party Monday in a new government to replace the country's ousted president, while U.N. Secretary-General Ban Ki-moon called for a return to stability "as soon as possible." The government will be led by current Prime Minister Mohamed Ghannouchi, who took charge of the North African country when longtime President Zine El Abidine Ben Ali fled last week. Ghannouchi's 19-member Cabinet will include three opposition leaders and 10 independents, he announced Monday. The new government will be tasked with leading Tunisia toward new elections, he said. Street clashes continued in Tunis on Monday, three days after Ben Ali's departure, with police firing tear gas into crowds of demonstrators in Tunis. Ban called on the new government to restore stability and the rule of law "as soon as possible." Ben Ali fled to Saudi Arabia on Friday after ruling the country for 23 years. His ouster followed weeks of protest over what Tunisians said were poor living conditions, high unemployment, government corruption and repression. Fouad Mebazaa, a former parliament speaker, was named acting president Saturday. He promised to restore stability and respect the constitution of the North African country. Speaking in Abu Dhabi, Ban told reporters the new government should protect human rights and guarantee freedom of speech and association. But he said he remained "extremely concerned" about the ongoing clashes in the streets. "This is a moment for the Tunisian people to strengthen the country's longstanding culture of political moderation and its attachment to peace," he said. "I call on the government and all stakeholders to ensure a prompt restoration of the rule of law, and to respect and accommodate the aspirations of the people. Tunisia must regain its stability as soon as possible, to pursue the path of development and prosperity." The new government includes opposition leaders Mustafa Ben Jaafar, who will serve as health minister; Ahmad Ibrahim, education minister; and Ahmad Najib Al Shabi, minister of local development. Among the holdovers is Ahmad Friaa, the interior minister. Friaa, speaking later on state TV, said 78 people have died in the clashes across several weeks and 94 have been injured, among them many police officers. He urged people to stop riots and to work with police. He vowed that those who should be held responsible for mistakes of the past will be punished. And Friaa ended his speech saying, "Yes for democracy, yes freedom, no for chaos." Friaa also said the cost of the turmoil of recent weeks is 3 billion Tunisian dinars (about 1.6 billion euros, about $2 billion U.S.). What do the opposition in Tunisia want? The announcements came a day after the country's army clashed with armed gangs and remnants of Ben Ali's personal guard. Police have arrested looters and as many as two dozen of the ousted president's relatives since Friday. Public protests continued Monday, as about two thousand people packed into a major road in Tunis. As the demonstrators tried to work their way toward the headquarters of the ruling party, police opened fire with tear gas. Opposition officials told CNN there were other peaceful demonstrations in towns in central and southern Tunisia. 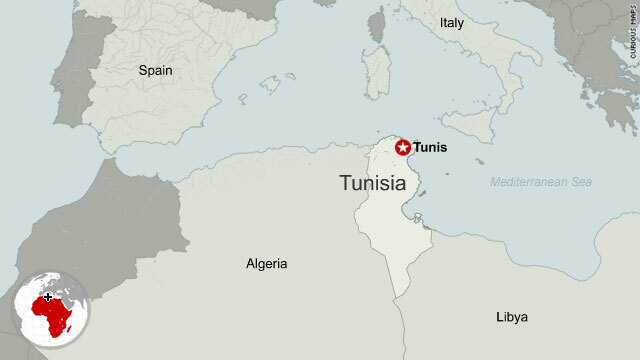 Tunisia's unrest was triggered by the December suicide of an unemployed college graduate, who set himself ablaze after police confiscated the fruit cart that was his source of income. Recent diplomatic cables from the U.S. Embassy in Tunisia, disclosed by the WikiLeaks website, revealed growing discontent with what Tunisians believed was widespread corruption and nepotism within Ben Ali's government. Experts say the kinds of protests seen in Tunisia could inspire similar actions, particularly by unemployed young people, in other Arab nations. In the weekend's chaos, a group of Swedish hunters visiting Tunisia said Monday they were stopped on the streets near Kasserine and beaten. Some of the men's eyes were swollen and blood-filled. One man had apparently been beaten on the back. Another man had a head injury. "To be fair, when we look back, we can understand that our guns scared them," said one of the men, Ove Oberg, who met with CNN Monday morning. The men said by the time the army came and understood the hunters were tourists, they had been badly beaten. "If the army didn't find us, we would have been dead," Magnus Josefsson said. Mohamed Guiga, a witness to Sunday's clash between government troops and Ben Ali's loyalists, said most Tunisians have rallied to each other's aid since the uprising. "We are proud of those people -- simple people, young people, normal people -- who take care of each other," Guiga said. CNN's Rima Maktabi, Ben Wedeman, Per Nyberg, Matt Smith and Neil Curry contributed to this report.